Fairway at Pocono Mountain Villas in Bushkill, Pennsylvania - IN THE POCONOS! - Buy a 7 Night Stay in a Studio, 2 or 3 Bedroom Suite! 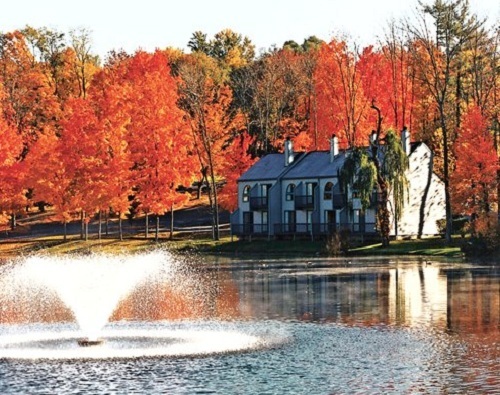 Enjoy 7 Nights at Fairway at Pocono Mountain Villas in Bushkill, PA - IN THE POCONOS! There’s an abundance of activities right within the Fairway Villas resort, including an 18-hole golf course, themed restaurants and live entertainment, plus indoor and outdoor pools for all-weather swimming, whirlpool, bumper boats, fishing, hiking, mini golf, children's playground and daily activities, shopping, outdoor tennis, basketball, volleyball, a variety of festivals, a video game arcade, paintball, and much more. Nestled in the picturesque Pocono Mountains, just 90 miles from New York City, the beautiful, award-winning Fairway Villas is a perfect destination for a wealth of fun and recreation. Water parks, waterfalls, and canoeing, rafting, and tubing on the Delaware River are great ideas for warm weather, as are nearby parks, cultural attractions, outlet shopping, and the excitement of NASCAR racing. There’s year-round horseback riding, plus skiing, snowboarding, and snowtubing in the crisp winters. Fairway Villas offers spacious two-bedroom villas with more than enough room for family and friends—up to six guests per villa. Comfortable living rooms and bedrooms feature TV/DVD, while fully equipped kitchens allow you the option of creating your own gourmet meals and enjoying them in your own dining room. Each unit has a charming fireplace, a washer/dryer and a deck to let you take in the beauty of nature. Studio Unit: Studio Unit will sleep 2 people and is equipped with a partial kitchen. OR UPGRADE TO A 3 BEDROOM SUITE ON THE FOLLOWING DATES FOR ONLY $150 FOR THE ENTIRE WEEK!